Every page more fierce than the last! Enjoy a good monster love story? Or a dark, Russian-style folktale? How about a flashback to the secrets of a cyborg's past, a post-apocalyptic romance, or a conversation between a boy and Death's dead assistant, while both sit in a diner and eat waffles? Whether you're already a Fierce Reads fan or you're a fan-to-be, this short story collection will satisfy your every bookish craving! 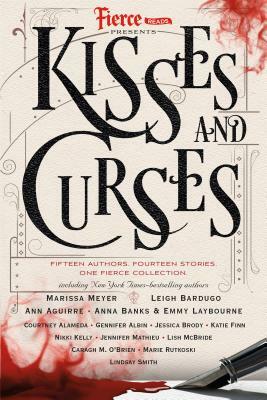 Featuring multi-genre tales from some of the hottest YA authors around, this anthology includes Ann Aguirre, Courtney Alameda, Gennifer Albin, Anna Banks, Leigh Bardugo, Jessica Brody, Katie Finn, Nikki Kelly, Jennifer Mathieu, Lish McBride, Marissa Meyer, Caragh O'Brien, Marie Rutkoski, and Lindsay Smith. By turns uplifting and sad, light-hearted and powerful, startling and laugh-out-loud, these bite-sized gems have one thing in common: You won't be able to put them down! Ann Aguirre has been a clown, a clerk, a savior of stray kittens, and a voice actress, not necessarily in that order. She grew up in a yellow house across from a cornfield, but she now lives in a terracotta adobe house in Mexico with her husband and two adorable children. The post-apocalyptic novel Enclave is her first book for young adults. She also writes the romantic science fiction series about Sirantha Jax, starting with Grimspace, as well as urban fantasy and paranormal romance. As Ava Gray, she writes paranormal romantic suspense. Gennifer Albin is the author of Crewel World trilogy Crewel, Altered, and Unraveled. She holds a master’s degree in English literature from the University of Missouri and founded the tremendously popular blog The Connected Mom. She lives in Poulsbo, Washington. Anna Banks grew up in a small town called Niceville (yes, really). She now lives in Crestview, Florida, with her husband and their daughter. She is the author of The Syrena Legacy series: Of Poseidon, Of Triton, and Of Neptune. Leigh Bardugo is a #1 New York Times–bestselling author of fantasy novels and the creator of the Grishaverse. With over two million copies sold, her Grishaverse spans the Shadow and Bone Trilogy, the Six of Crows Duology, and The Language of Thorns—with more to come. Her short stories can be found in multiple anthologies, including Some of the Best from Tor.com and The Best American Science Fiction & Fantasy. Her other works include Wonder Woman: Warbringer and Ninth House. Leigh was born in Jerusalem, grew up in Los Angeles, graduated from Yale University, and has worked in advertising, journalism, and even makeup and special effects. These days, she lives and writes in Hollywood, where she can occasionally be heard singing with her band. Jessica Brody knew from a young age that she wanted to be a writer. She started "self-publishing" her own books when she was seven years old, binding the pages together with cardboard, wallpaper samples and electrical tape. Brody graduated from Smith College in 2001 with a double major in Economics and French and a minor in Japanese. She went to work for MGM Studios as a Manager of Acquisitions and Business Development, and then, in 2005, she quit her job to follow her dream of becoming a published author. Brody is the author of two novels for adults--The Fidelity Files and Love Under Cover--and the young adult novels The Karma Club and My Life Undecided. Jessica's books are published in over ten foreign countries including the U.K., France, Germany, Czech Republic, Russia, Brazil, China, Portugal, and Taiwan. She now works full time as a writer and producer, and currently splits her time between Los Angeles and Colorado. Katie Finn is the author of the Top 8 trilogy. She's never plotted revenge on anyone (who didn’t deserve it) but has been known to assume another identity. To this day, she and Morgan Matson have never been seen in the same room. She lives in Los Angeles, in a house she wishes was a lot closer to the beach. Nikki Kelly is the author of Lailah, Book One of the Styclar Saga. Lailah was first launched in serial form on Wattpad, an online readers' and writers' community. Within six months, the novel had over one million reads. Nikki lives in London with her husband and their daughter. Emmy Laybourne is a screenwriter, lyricist, and actress. She has acted in movies, television, and improv groups including Chicago City Limits. She lives in Chestnut Ridge, New York, with her husband and their two children. She is the author of the Monument 14 trilogy. Jennifer Mathieu started writing stories when she was in kindergarten and now teaches English to high school students. She won the Teen Choice Debut Author Award at the Children's Choice Book Awards for her first novel, The Truth About Alice. She is also the author of Devoted and Afterward. She lives in Texas with her husband, son, and dog. Lish McBride grew up in the Pacific Northwest. It rains a lot there, but she likes it anyway. She spent three years away while she got her MFA in fiction from the University of New Orleans, where she managed to survive the hurricane. She enjoys reading, having geek-laden conversations about movies, comics, and zombies with her friends, and of course trying to wear pajamas as much as humanly possible. She lives happily in Mountlake, WA, with her family, two cats, and one very put-upon Chihuahua. Her debut novel, Hold Me Closer, Necromancer was named an American Library Association Best Book for Young Adults and was a finalist for the YALSA William C. Morris Award. Caragh M. O’Brien is the author of the BIRTHMARKED trilogy and THE VAULT OF DREAMERS trilogy. Born in St. Paul, Minnesota, Ms. O’Brien was educated at Williams College and earned her MA in the Writing Seminars from Johns Hopkins University. Her young adult science fiction has been honored by the YALSA Best Fiction for Young Adults, the Amelia Bloomer Award, the Junior Library Guild, and numerous state reading lists. A former high school English teacher, she now writes young adult novels full time from her home in rural Connecticut. Lindsay Smith is the author of Cold War era espionage novels Sekret and Skandal, fantasy novel Dreamstrider, and Japanese time travel novel A Darkly Beating Heart. She writes on foreign affairs and lives in Washington, D.C.